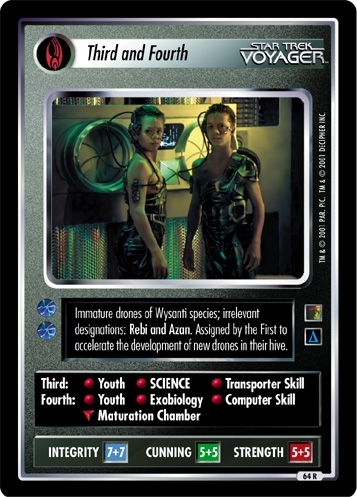 ﻿﻿﻿Immature drones of Wysanti species; irrelevant designations: Rebi and Azan. Assigned by the First to accelerate the development of new drones in their hive. Gender is irrelevant. Species: Borg / Borg. There are 35 entries for Third and Fourth (ST1E 13 R+ 64) at the Tradeplace (33 haves and 15 wants). Click here to see all trade list entries for this Rare Plus card!